During the event period, items will be gifted depending on the number of times you have cleared mazes and raids with a 2-man Party. ※ There is no assigned difficulty. ※ If the same character is in multiple pairs, each pair will be treated separately. ※ The rewards for each grade can only be obtained once per character. By clearing assigned locations 15 times with a 2-man Party, you can obtain event titles at a later date. 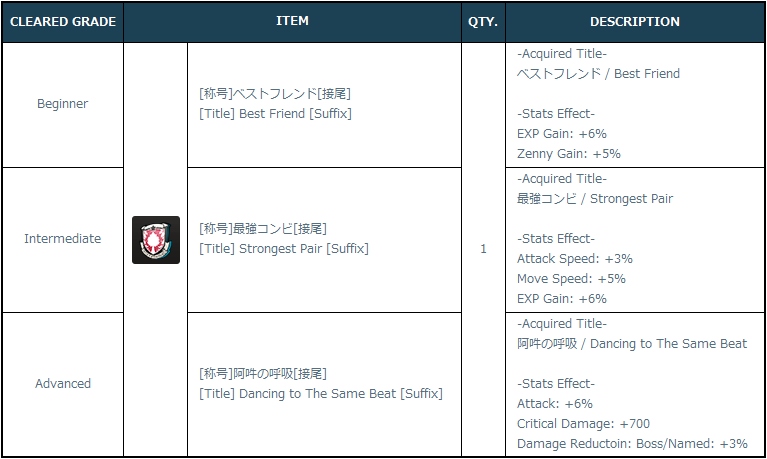 ・ If Character A & B’s Party have cleared 「月下の狂舞」 4 times and 「嘆きの空」 11 times, they can obtain 「[Title] Best Friend [Suffix]」. ・ If Character C & D’s Party have cleared 「百の剣」 10 times, and Character D & E’s Party have cleared 「百の剣」 6 times, they will not be eligible to obtain the rewards since they have not achieved 15 times. ・ If Character F & G’s Party have cleared 「Golden Citadel」 15 times, and Character G & H’s Party have also cleared 「Golden Citadel」 15 times, they will obtain 「[Title] Dancing to the Same Beat [Suffix] 」. ■ Form bonds more than anyone else! During the event period, additional items will be gifted to the Top 10 pairs (20 characters) that have cleared many mazes with a fixed 2-man Party. ※ The aggregation of clear count will be done for each pair. ※ Even if you win through multiple pairs, the items for each grade can only be obtained once. ・ The 「Reward Item/s」 will be distributed to the characters on the item distribution date. During the event period, the Event GMs will recruit parties and participate in Casual Raids. Items will be gifted depending on the accumulated number of times the Event GMs’ parties have cleared the Casual Raids. ※ Attribute Casual Raids will be excluded in the event. The Event GMs will recruit parties in the 「Party Search Function」 (“N” window). You can join the party by applying to the Event GMs’ party recruitments. ※ In order to participate in the event, it is necessary that you can participate in the Casual Raids beforehand. ※ If you do not move to the specified area and channel within a certain time, or if you have insufficient FP, you will be removed from the party. ※ Not everyone will be able to participate since there is a limit to the number of people that can join the Event GMs parties. From June 09 (Saturday), 00:00 ~ 23:59 JST, clear one of the Casual Raids, 「Last Carnival」, 「Junk Hive」, 「Bandit Highway」, and 「Iron Castle」 at least once. ※ Please note that you will not receive the rewards each time you achieve the condition. The rewards are not obtained cumulatively. ※ Even if you didn’t join the Event GMs parties, you can still receive the rewards as long as the achievement conditions have been satisfied during the event period. If the Event GMs’ parties cumulatively cleared Casual Raids 12 times, the characters that have achieved the conditions can obtain 「BP Box (5000)」. ■ Fight together with the Event GMs! During the event period, you can obtain an additional item by clearing a Casual Raid with the same party as the Event GMs. ※ To let other players participate, please refrain from joining the Event GMs’ parties multiple times. ※ This reward is aggregated for each account, and will be distributed in the account mail. ・ This event will be both on a per character and account basis. ・ The 「Accumulated Clear Reward Item/s」 will be distributed to the characters on the item distribution date via mail.